Last edit: 20 May 2014, minor corrections to Goblin and Swamp Stalker sheets. Dragon Dice is a moderately complex game. Once you start playing the game and rolling dice, things fall into place pretty well. But for new players (and those of us getting back into the game after a nearly 20 year absence) having play aids with the rules outline, magic spells, and special dice icon abilities all spelled out is very helpful. At first glance, the rulebook itself is quite large and daunting. But the vast majority of the book are rules for many expansion dice sets that optional to use. And only a small portion of the rules for special spells and particular unique dice results pop up in a single game. The current rules are available as a free pdf download. 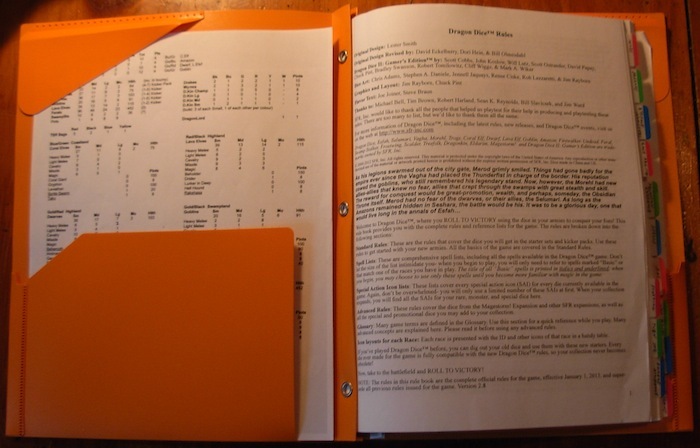 I found it very handy to put the rules in a binder and add Post-It page tabs to help quickly find things. There are also a number of play aid downloads on the SFR website, including some large format Playmats designed by Tiffany that can be printed out on 17″ x 22″ paper and laminated. These sheets are very nice and very helpful, but I wanted to do a slightly different design of my own which would be easier to print, laminate, and carry around. I started on this project shortly after Pax East 2013. Got a burst of work done, but then sidetracked off into all the other projects on the blog here over the past year…. But got back to finishing up the first draft just in time to take for a test roll at Pax East 2014, and continued the burst of working right afterwards to finish them all up. The file labelled Top4 is laid out with (4) mats to be trimmed down to 5″ x 7″ each and laminated separately; one each for the Home, Campaign, and Horde areas for the army, and an optional generic Dead Unit Area that can be used instead of the larger Army mats. The full-sized Reserve Mat is used with all armies and includes the Elemental Spell lists available to all the races. Each of the specific Army Sheets includes the unique spells and abilities of each one. These can be laminated separately — or as when I did mine, a Reserve Area mat can be placed on the back of each Army mat and laminated together so that they are reversible.